Hi everyone! I am a representative with Fold-a-Cover. Just wanted to let you all know that we are now an active member and sponsor on this forum and I am here to answer any questions or concerns you may have. Here is a little bit about our company and our products if you are not familiar with them. Fold-a-Cover created the original hard folding tonneau cover and we have been manufacturing them right here in the USA since 1988. Our latest model is the G4 Elite; it can be opened from the front or back of the truck bed and has flush mounted handles that allow you to open either side of the cargo area quickly with one hand without ever having to opening the tailgate. 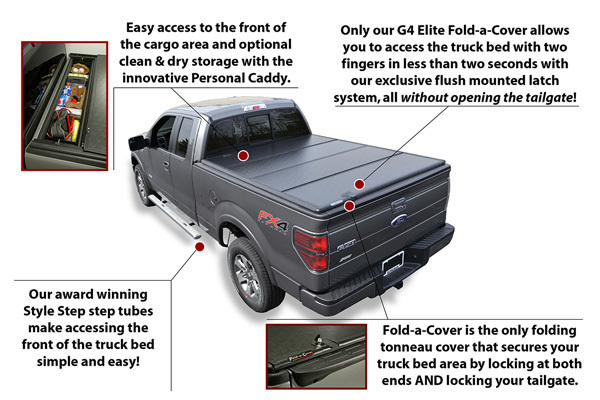 More recently we have developed our Personal Caddy, which is a drop in toolbox that fully integrates with our G4 Elite hard folding tonneau cover. We also have our Style Step, a step tube manufactured out of a single aluminum extrusion so it will not rust. Our Style Step also won SEMA’s Best New Product for Trucks, Vans, and SUV’s in 2007. Since we are new here we wanted to offer everyone a special coupon for letting us be a part of your community. Use DodgeForum25 to get an extra $25 in addition to any current promotion on any purchase made in our Factory Store! I will try to respond to posts in a timely fashion or feel free to email me with any questions you may have as well. Last edited by Fold-a-Cover; 11-05-2012 at 09:27 AM. Enjoy the site and welcome aboard.